Craig Smith is quick to remind folks that Friday night will be game No. 35 for his group. And when you get this deep into your season, there’s a reason you’re now starring on the national stage, on national TV, with just a shot to make a run at the whole thing. “There’s not much we haven’t seen,” he said. He’s right, too. 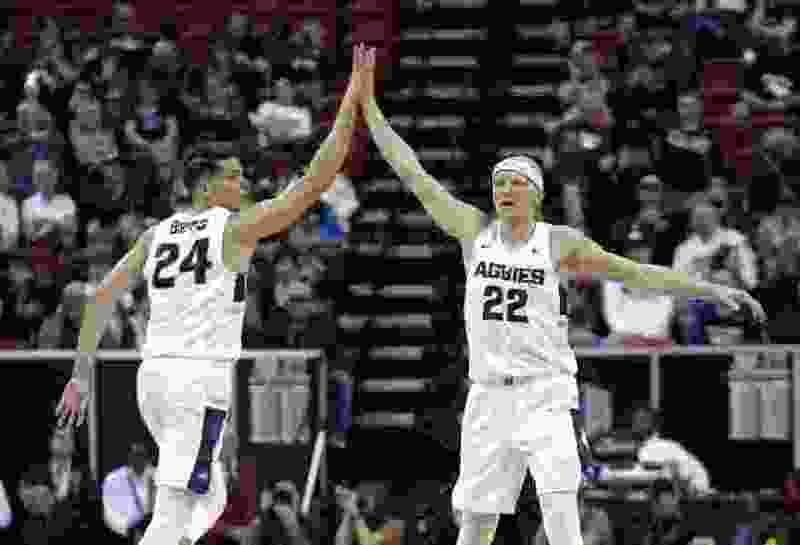 The Utah State Aggies are motoring along at 28-6, as Mountain West Conference regular-season champs and tournament champs, winners of 17 of their last 18, the longest such streak since 2010-11. But their first-round matchup presents such a distinctive test that it’s not like preparing for pretty much any other team. The No. 8 Aggies and No. 9 Washington Huskies face off Friday in Columbus, Ohio, in the first round of the Midwest region, and the Huskies will be daring the Aggies to adapt to their vaunted 2-3 zone, which Washington head coach Mike Hopkins brought with him after years as an assistant under Syracuse coach Jim Boeheim. What makes this first-round bout among the most fascinating in this opening week of the NCAA Tournament is it’s strength vs. strength. If you’re a hoops geek, geek out on it. The Aggies can shoot it, they can move the ball around the arc, and they have a talented two-way big man in Neemias Queta, who can pass out of the block with ease. The Huskies, conversely, are filled with athletic big men who can create their own shot, play isolation ball if needed, and have arguably the best 1-on-1 defender in the game to combat one of the best players in college basketball in USU junior and MWC Player of the Year Sam Merrill. Senior Matisse Thybulle grabs headlines for being a thorn that simply will not go away. He’s the two-time Pac-12 Defensive Player of the Year and up for the Naismith Defensive Player of the Year award. The 6-foot-5 guard is the only player in the last 25 years to have 110 steals and 72 blocks and leads college basketball in 3.55 steals per game. Merrill will have his hands full, no doubt, which makes this game that much more intriguing. Hopkins knows the talk of this game — and every game, for that matter — will revolve around how opposing teams adjust to the Huskies’ unique style of play. He knows it’s very difficult to mimic in practice, especially when you have the luxury of a player like Thybulle on your side. But the Washington coach isn’t assuming this will be a walk in the park. USU’s unselfish style of play can make the zone approach weak if prepped for the right way. Merrill is already preaching patience, which will be necessary come Friday, because the Aggies will need it when the ball tips in Columbus.